I'm loving two things today (well actually more, but for the sake of time limitations, we'll talk two). Number one - a DIY tutorial. Number two - a giveaway. The two seem to go hand in hand, don't you think? 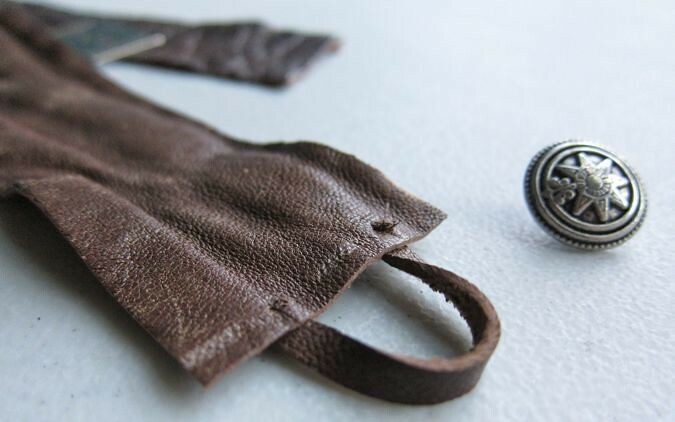 Cut two pieces of leather, approximately the size of your wrist circumference. 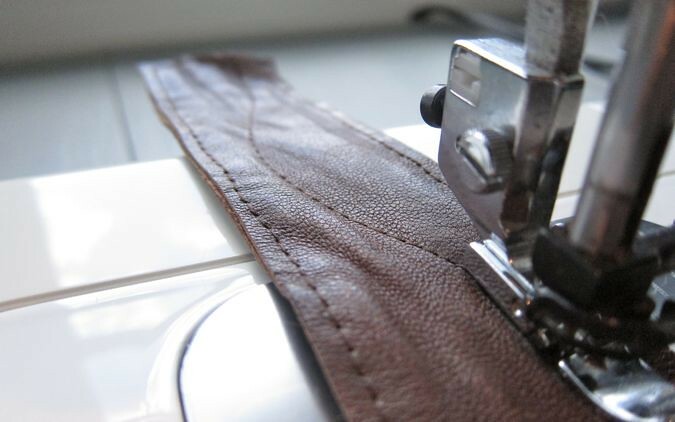 I cut my strips 6.5" x 1.5"
Cut another small strip about 3.5" x .25"
Clip the smaller strip to one end of the leather. Make sure that the button will pass through. 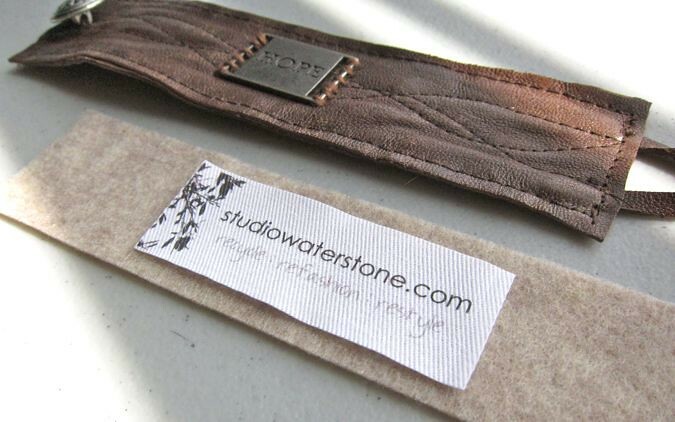 Stitch this piece to the leather. 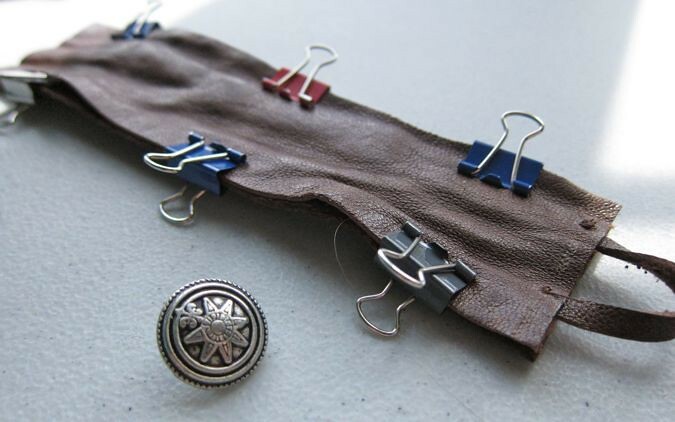 Clip both pieces together, right sides out. Stitch together around the edges. I got a little carried away and stitched a few swirls. 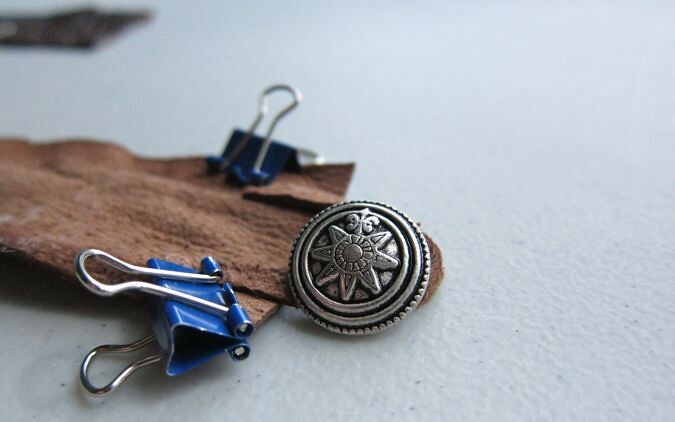 Clip the charm to the center and, using your yarn, attach the charm to the leather. 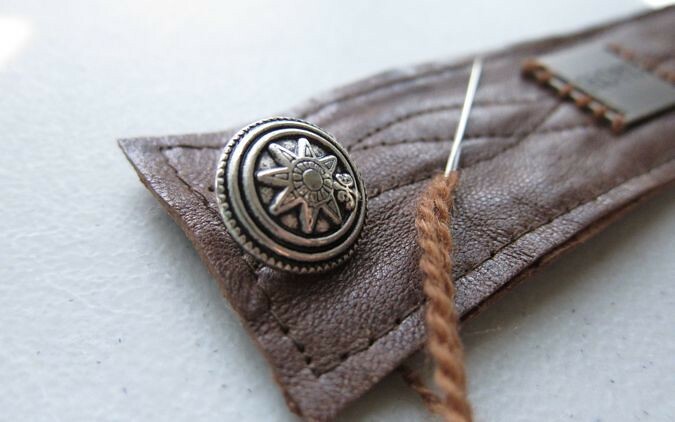 Center the button and attach it to the leather. 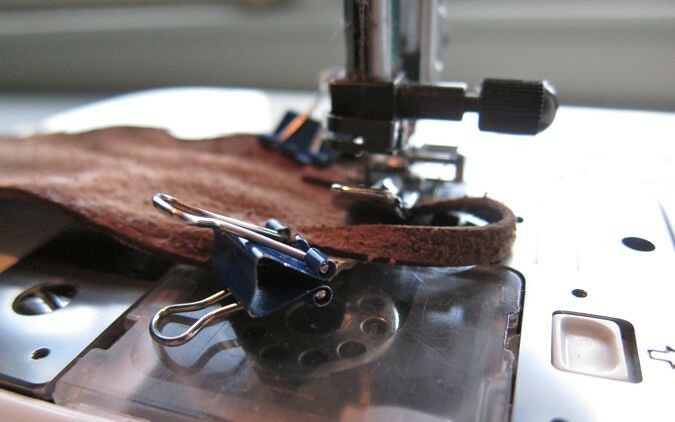 Cut a piece of felt approximately 1/4" smaller around than the leather. 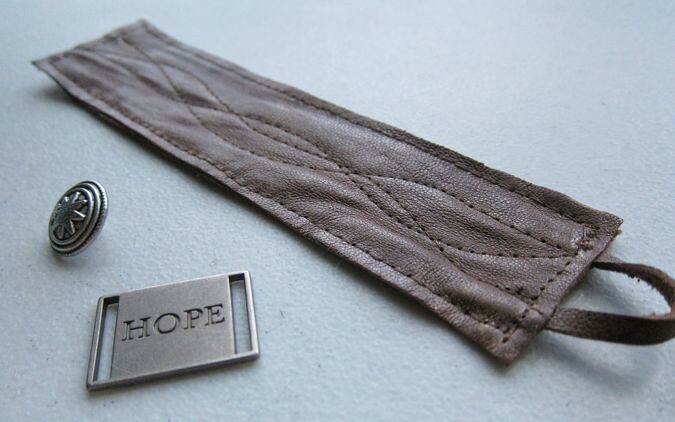 Do you REALLY want this recycled leather hope cuff but don't want to make it? No problem! I'm giving it away. With all of my giveaways, I provide a plethora of ways to enter. 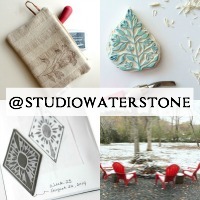 3: Blog, Facebook OR Tweet about this giveaway. 4: What's the most unusual thing in your handbag right now? Yep, that's an entry, too. Good golly Miss Molly! That's a lot of entries! Enter one time, enter four times or make your own - it's all up to you, my friend. Let me know what you've done in THIS POST comment section. Please leave a link in the comment section if you've mentioned this giveaway. Your chance to enter will end this Sunday, April 17th at 11:59 EST. I'll reveal the winner on Monday. I follow you on Blog Reader! 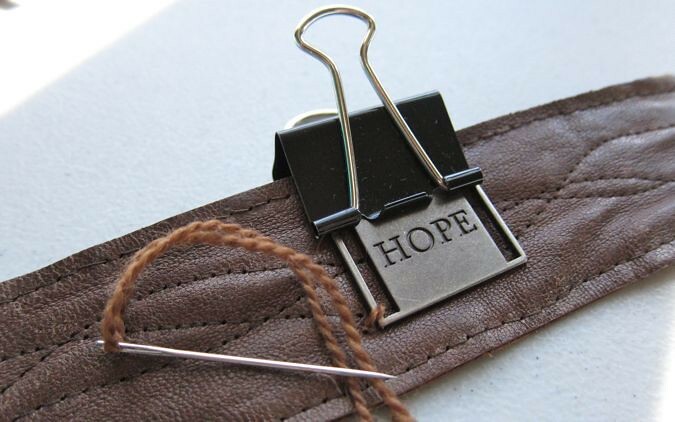 My favorite word is HOPE!!! I would love to win! Oh, and I'm a follower! Most unusual thing in my bag right now is a toy train and two toy trucks and I have a girl. I tweeted about your give-a-way! Super cool cuff! I am a follower of your blog! The most unusual thing in my purse would be a crayon my nephew told me to hold on too because he would be checking to make sure I carry it everywhere! LOL! I have a giant Kitty head full of mints. It reminded me of my youth and love for Hello Kitty! 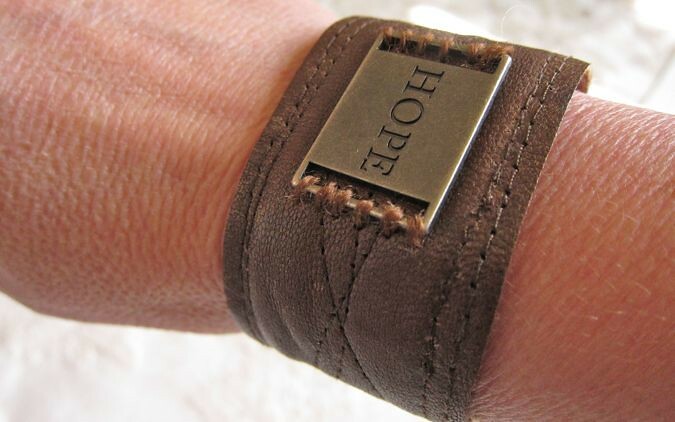 This is a beautiful cuff! The most unusual thing in my bag right now is my lip ring. I had an interview the other day and forgot to take it out before I left the house. I have done number 1, 2 and 4 of the winning options - might blog about it later in the week (I want my latest posts of the bead babes challenge up for a little longer). The most unusual thing in my handbag right now is a map of Paris, and used tickets to a concert I just went to during a weekend trip ;-). The most peculiar thing I carry around in my purse is a multi-tool. I'm a firm believer in always being a woman prepared and this guy has stepped in to rescue a situation more times than I can count. It has screwdrivers and pliers, a pocket knife, and a can opener. 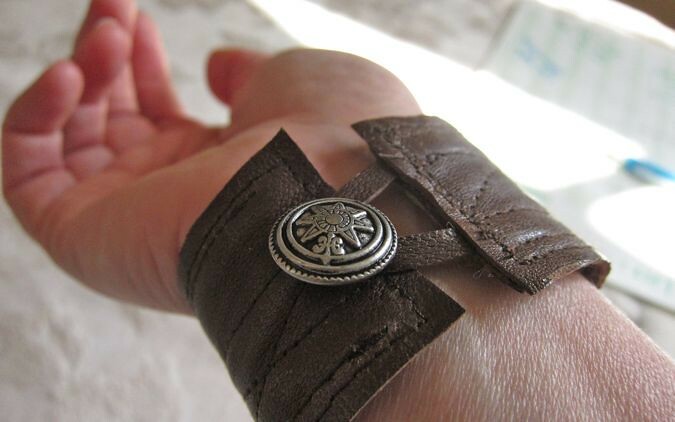 I love the cuff - you do the most amazing things! The most unusual thing in my purse now is a little screwdriver with several heads to it. Always be prepared!!! I already stalk oh I mean follow you everywhere I can. 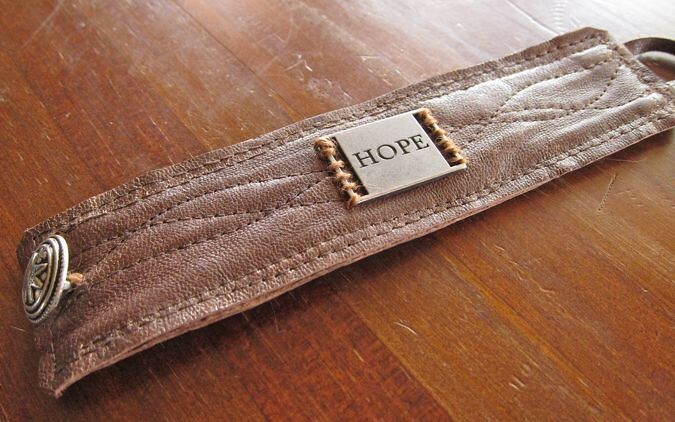 This would be awesome to give to my sweet daughter as she is 18 and sometimes needs a reminder. 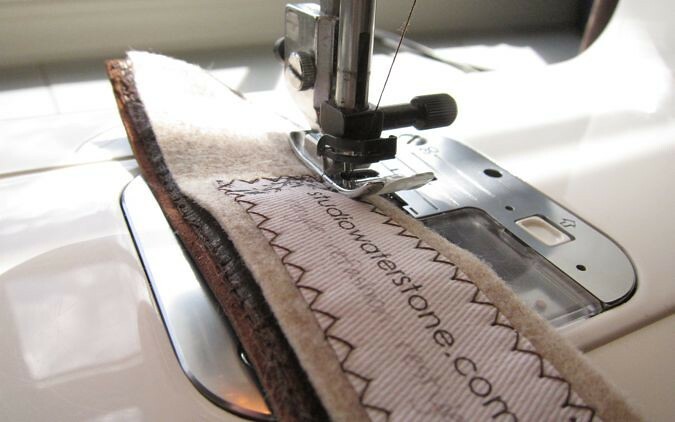 I love your tutorials so much and I may actually start sewing again sometime soon. Oh the most unusual thing I have in my purse right now is a lipstick I never use. I am on your mailing list, I follow and the weirdest thing in my handbag are my shocking pink headphones. The most unusual thing in my purse, hmm, I just cleaned it out so it is probably a couple gift cards that have only pennies on them. For some reason I can't throw them out and I rarely remember to use them when I'm in the stores. im definitely a follower and i LOVE LOVE LOVE this bracelet..
the most unusual thing in my purse... a little railroad spike that is about 3 1/2 inches long,, i ran over it two weeks ago and had a flat.. but its so cool looking. I kept it. i shared on my facebook..
i've joined your mailing list too... thanks for the chance to win this. I followed over from Hope Studios link party, and I'm sure glad I did! I'm now a follower of your blog. 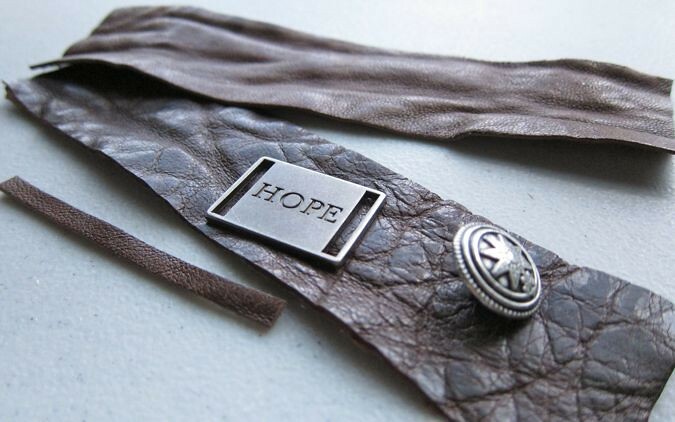 Love this bracelet and if I don't win it, you can bet I'll be making my own! Luv the cuff!! Totally fantastic. I am following you on facebook now to and adding you to my favs!!!! the word clever just doesn't measure up! that cuff is SO great! a lucky winner for sure! off to do some subscribing & liking! with a skip in my step! thanks for your kindness btw! Just facebooked it on the facebook I started yesterday...soooo 2 people will see it. Sorry! Already on your mailing list! Wahoo! Most unusual thing...I just cleaned it last week, but there is a tape measure. Not to weird. Beautiful bracelet thanks for the opportunity to win, I have to now go follow you on facebook. Thank you for spreading the love with this wonderful giveaway! would love to make one!!! i follow your blog!! the most unusual thing in my handbag is a thing of tooth paste.. no tooth brush to use with it!! 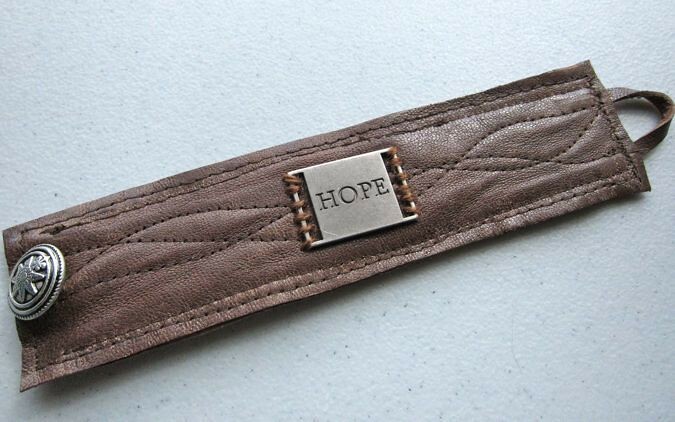 i love this cuff!! The most unusual thing in my purse is broken glass. This isn't just any glass, this is glass from a car accident I was in in October. My son and I survived what should have been a fatal crash and when my side window shattered the glass fell into my purse. I keep it there to thank God every day that we survived. I follow you on Google Reader! Yay!